It’s that time of year. The time to celebrate and enjoy time with family and friends. But no matter how hard we try, the holidays also bring an extra level stress from the wicked colds makings their rounds to our bodies feeling out of sorts from overindulgence. So, how do you stay healthy and happy straight through the new year? Try these 3 easy tips from Lori Kenyon Farley of Ritual Wellness which are sure to keep your holidays on a healthy track. Although it can feel overwhelming to fit in work, parties, present shopping, and your workout, you can do it all with less stress, if you just plan ahead. Plan to exercise. Pack your gym clothes in your car, sign up for that class at Pure Barre or spin, and schedule workout time into your week. If you have a party on Thursday and Friday nights, then choose classes on Monday and Wednesday. Plan to eat healthy. Bring a juice or a granola bar with you so you will have a healthy snack on your way from the office to the gym. Plan to decompress. Make a cup of tea, curl up in front of the fire, and think about all the many things you have to be grateful for this holiday season. To boost your immune system, focus on healthy habits. Switch out your afternoon coffee (or better yet, your morning one!) for a juice or smoothie. 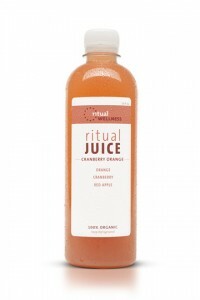 Choose a juice that is raw, and cold pressed with lots of organic produce. Choose flavors you enjoy, as they all help in different ways. If you like veggies, choose a green juice to boost your nutrient consumption. If you like tart or sweet, have a ginger lemonade or a cranberry orange (pictured right) to boost your immune system directly. What you feed your body will greatly impact your ability to stay healthy even if those around you are sick. Another great immune system booster? Sleep. You should do your best to get plenty of of it, even though you are busy. If you like to watch TV in the evenings, DVR some of your favorite shows and catch up on Saturday afternoon, rather than staying up late. Some nights, you will have late commitments, so try to go to bed a little early on the alternate nights. A well nourished immune system and well rested body are much better able to handle the unexpected. Even the thought of holiday weight gain sends some people into a funk! And the buffet table at parties can be super enticing, especially if you aren’t planning ahead. When you know you’ll be attending an event, be sure to eat nutrient rich foods the day of a party. Have a lower calorie breakfast and lunch, with plenty of lean protein and fiber (think oatmeal and egg whites for breakfast and mixed greens with chicken for lunch), so you don’t go to the party starving. Keeping a food journal can be the best way to stay on track, so occasional indulgences don’t turn into an every day habit. When you do load your plate, be sure to choose those special foods you have been craving, and then to savor them while you eat them slowly. Remember the holidays are a time to enjoy family and holiday traditions. If you incorporate healthy habits and activities, while allowing yourself to indulge, your mind and body will thank you.